It's St. Patrick's Day and to celebrate I tried my hand at homemade Irish sausage or "Bangers." It's actually quite simple and a great way to use up some spices you have lingering in your pantry! Some folks seem to think homemade sausage requires some elaborate equipment but if you have a food processor, you can make homemade sausage in no time. If you do prefer to make sausage in casings, then you may have to get your hands on some specific tools like a KitchenAid sausage stuffer attachment. I recently got a sausage stuffer attachment because I wanted to try my hand at homemade sausage. It's a fun gadget to have that I plan on using more often in the future. To break it in, I made these Irish Bangers, just in time to celebrate St. Patrick's day! 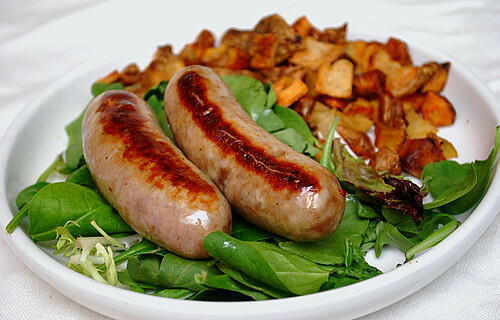 The sausage mixture itself is a flavorful combination of spices and pork. Since I'm trying to use up the random ingredients I have in my pantry, this recipe allowed me to use some spices sitting in my spice drawer. To prepare these once I made the sausage, I browned them and allowed the sausage to simmer in Guinness beer to take on more flavor. I served these with a simple preparation of roasted diced potatoes tossed with a little extra virgin olive oil and some Montreal seasoning. Cut pork into bite sized cubes and place in food processor. Pulse the pork until it gets to a medium or coarse grind. Remove half of the pork from the food processor and set aside. Pulse the remaining pork in the processor to a fine grind. Place all the pork (coarse and fine grind) in a large bowl and add the spices and water. Mix well with your hands until combined. Stuff the sausage into small casing links or form into patties. Place in a baking dish and cover with plastic wrap. Chill overnight in the fridge before you freeze. To prepare, fry in a skillet with a little oil until browned. Add a bottle of beer (such a Guinness) and allow to simmer until fully cooked. Serve hot. With a good pastry bag you should be able to pipe the meat into the casings. Oh I love bangers and mash! I must try this recipe! Those look fantastic! And the recipe doesn't look too difficult-maybe I will try these. Thank you for posting.